Today you’re in for a special treat, and we are getting an insider’s view at 7 of the best easy hikes in Oahu. In this post my friend and fellow outdoor blogger, Jessica, a.k.a. "The Walking Mermaid", gives us a list of her favorite top hikes in Oahu that are great additions to any Hawaii vacation and perfect for families to go and enjoy together. Jessica even makes a point to tell us about some of the best trails for hiking Oahu with kids. 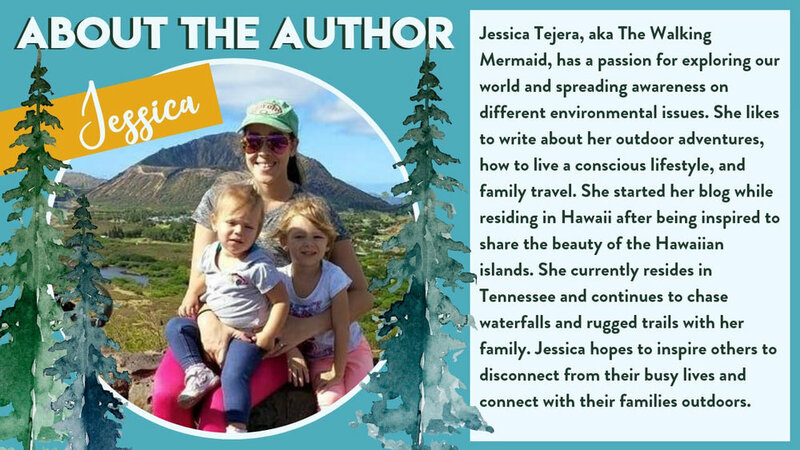 Jessica was lucky enough to live on the island of Oahu for two years and had the opportunity to scope out many of its beautiful hiking trails with her family while she was living there. So before you go planning to only lounge on the beach during your Oahu vacation, make sure to check out her list of best hiking trails in Oahu and add a couple of them to your plans! To learn more about Jessica, check out her full bio at the bottom! Hawaii is well known for its jaw-dropping islands nestled in the Pacific Ocean, and Oahu is one of its 8 beautiful islands. While many people come to Oahu to enjoy the beach and waves, there are also ample opportunities to venture off of the beach and explore the island further. From epic lush green ridgelines and trails leading to beautiful waterfalls, to exploring hidden caves and looking for unique locations on the Island, Oahu has got it all, and adventure is literally around every corner. Jessica did an awesome job detailing her favorite easy hiking trails in Oahu in the list below and has provided some additional information on how to get to the the various trailheads. The map below is just a high level look at where each of the Oahu, Hawaii hiking trails are located around the island, including some of the best waterfall hikes in Oahu, but be sure to check out Jessica’s more detailed location directions under each hike’s description. So without further ado, here are Jessica’s 7 favorite easy hikes in Oahu. Challenges: Steep with a rugged path, loose rocks, some areas may be slightly overgrown. This is one of the best hikes on Oahu, and I immediately fell in love with it! I first did this hike with my cousin and we had a lot of fun doing it. The views are spectacular the entire time and only get better the higher you hike. Your journey starts almost immediately after leaving the parking area. There is a lower cave before the start of the trail that you can explore before eventually continuing on the main trail that heads to the upper Makau Cave. The trail is rugged with some sections where you climb holding onto a rope. Once you are through that section you will find yourself hiking along a very narrow trail. The trail is literally straight uphill on one side and a straight drop on the other side. Try not to look down though, you don’t want to miss the amazing view straight ahead of you. As you continue on the trail you will make your way alonog the curvature and to the cave. The trail itself is not long, just slightly time consuming in some areas where climbing is a must. It is a hike that you will always remember. Pro Tip: Make friends with the locals and you may be lucky enough to find the hidden mermaid cave that's not too far from here. Location: West side coastline heading towards Kaena Point. You will see a sign saying Makua Caves (also known as Kaneana Caves). Parking will be on the oceanside of the road or on the side of the road. Trailhead will be towards the left side of the Lower Makua Cave. It may be a little hard to find depending on the overgrowth and time of year. Lanikai Pillbox trail (also known as Kaiwa Ridge hiking trail) is well-known for its gorgeous views of “The Mokes” or the “Twin Islands” off the coast of Kailua. The larger island (left in the above photo) is Moku Nui and the smaller one is Moku Iki. Lanikai is also known for it’s beautiful turquoise blue waters. You are probably wondering what a pillbox is. These pillboxes were mass produced during World War 2 by the military to stand guard and fight against enemies. They were built out of reinforced concrete. Now they are known for hiking pit-stops. You can find them in various areas across the island such as Diamond Head, Koko Head, Ehukai, and of course, Lanikai. To hike Lanikai Pillbox Trail I highly recommend arriving early. It is not a shaded hike and the later you arrive the harder it will be to find a decent parking spot. It is, however, fairly easy to find the trailhead. The beginning of the hike is probably the hardest part. It is very steep and slippery. Make sure to wear proper hiking shoes and watch your steps closely as you hike the trail. I have seen many people not be cautious and get injured. Once you are done with the steep area you will continue your way up the trail. You will continue to go up in elevation but it won’t be as bad now. Don’t forget to stop and take in the view. The Lanikai Pillbox Trail has two pillboxes you can hike too. My husband has hiked to the second pillbox but I have only hiked to the first one because I had my little ones with me. The trail to the second pillbox has more climbing so we wanted to play it safe, especially with the steep slopes on the side of the mountain. Pro Tip: After the hike don’t miss out on a day at the beach. Lanikai is known for their warm clear waters and it is perfect for snorkeling. You can also paddle board, kayak, or just absorb some sun while you relax reading a book. Oh, and don’t miss the honu (turtles). You can find them swimming in these areas. Parking: $3 at the parking area by the small shop at the trailhead. Challenges: some areas have a very narrow trail with a steep drop off on the side. Be cautious on these areas. The Manoa Falls hike is one of the best easy waterfall hikes in Oahu and one of the best kid friendly hikes in Oahu. This beautiful hike through the jungle in Honolulu will take you all the way to a beautiful waterfall. It is a fairly easy hike with flowers, gorgeously huge trees, and even local fruits. Once you reach the end of the trail you can see the waterfall. The waterfall makes for a great relaxing lunch spot before turning around and heading back out. It is best to hike this trail after a heavy rainfall to see the waterfall flow more beautifully, but be aware that it will be muddier on the trail. Also, there are a lot of mosquitoes so make sure to bring bug repellent! And check out what we recommend as essential day hiking gear to have with you on day hikes, including our favorite trekking poles, hiking boots, water filters, and more! Challenges: Heat is the main challenge. It is best to go early morning when the sun is not as strong. Many areas are not shaded. Bring sunblock, sunglasses, hydration, and a hat. Honolulu has several hikes for you to enjoy with waterfalls, craters, gorgeous ocean views and more. Diamond Head Crater is one of the best hikes in Honolulu with its rugged paths that zig zag up the inside of the crater ultimately reaching the pillboxes on the crater’s rim. The view overlooks the beautiful city of Honolulu down below and all of the south oceanside of the island of Oahu. For park hours and parking fees view the Diamond Head State Park website. Pro Tip: To see how to spend an entire fun filled day in Honolulu, Hawaii including this hike check out my blog post here. The post includes details on my favorite restaurants, bakeries, beaches, and more. Honolulu is the heart of Hawaii and has a lot to offer. Challenges: Heat is the main challenge. It is best to go early morning when the sun is not as strong. Many areas are not shaded. Bring sunblock, sunglasses, hydration, and a hat. Comfortable shoes are a must on this trail as well! The Makapu’u area is home to beautiful tidepools, views of Sandy Beach, Koko Head Crater, and many more breathtaking spots. Makapu’u Lighthouse trail is one of the best Oahu hikes with very amazing view! It is a fully paved hike the entire time but definitely worth the time. You will be hiking up over 1,200 feet in elevation to reach the lighthouse. If you continue along the trail past the lighthosue toward the pillbox, you will gain even more elevation and the hike will be a bit longer than 3.3 miles. The views are beautiful though. The lighthouse area has been recently renovated making it a popular tourist destination, but don’t let this stop you from doing this hike. I recommend arriving early to take advantage of the cool morning breeze and beating the crowd. Challenges: It is best to hike in the morning time when there is less foot traffic and cooler weather. Also, there are no restrooms on site, so bring toilet paper or baby wipes just in case. This is one of my all time favorite North shore hikes in Oahu. When you arrive at the trail you will hike through the mountain and up to two different pillboxes. The furthest pillbox is the most famous one with a peace sign on it. Both pillboxes overlook the Banzai Pipeline beach area. You can also see the beautiful tide-pools below. Due to social media, this hike has become very popular over the years. Pro Tip: Once you are complete with your hike, head on to the beach area for some delicious food truck food and to cool off at the beach. Time: 1 hour unless you take your time enjoying the gardens. Challenges: It is best to hike in the morning time when there is less foot traffic and cooler weather. Bring hydration, a swimsuit, a towel, snacks, and comfortable shoes. Another beautiful waterfall hike in Oahu the trail leading to Waimea Falls. You can find this hike on the North Shore of Oahu. This gorgeous hike follows alongside a small creek running from the waterfall all the way down to Waimea Bay. The entire trail is paved. Along the way you can find botanical gardens, historical “hut” buildings, and on some weekends you can find events, booths to shop at, ice cream, and other fun things to do. This is what most people call a “tourist trap” but if you want to spend the extra money, I do recommend visiting this trail (view admission fees here). The Waimea Falls area is also the location where many movies were filmed at such as George of the Jungle, LOST, Maui Jims, Bay Watch, the Adidas Wanderlust campaign, and The River just to name a few. Well I hope you enjoyed my list of favorite easy hikes in Oahu, and found one you'd like to hike on your next Oahu, Hawaii vacation. Whether the hike you choose is easy or difficult, Oahu never disappoints. The Island is filled with awe, beauty and adventure, so don’t be surprised if you’re left feeling mesmermized by its charms. I hope this article helps you enjoy the beautiful island of Oahu. You can find more of my Hawaii adventures here. You can follow Jessica and her adventures over on Instagram, Facebook, Pinterest, and her blog. We hope you enjoyed this guest post from Jessica that 7 of the best easy day hikes in Oahu. I wish I could say we have been to Hawaii, but unfortunately that one is still on the bucket list! It’s only a relatively short flight from California though, so maybe one of these days we will finally get a good deal on a flight and make it over there! Also, be sure to check out these essential hiking resources!